This one is obvious. We can do it through both SSMS and BIDS. Then, we can just execute the generated query. 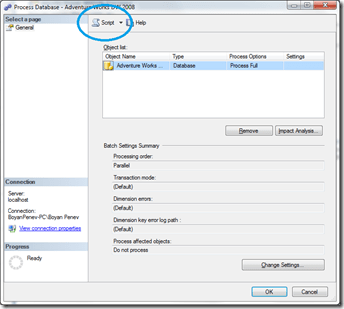 This Control Flow task allows us to configure any settings and then add it to our ETL process. Quite handy. Using AMO we can do any maintenance tasks through PowerShell, including an object process. Probably not a fully exhaustive list, but I hope it helps with giving developers some options when it comes to this trivial and crucial part of the development and deployment process. I have lately started visiting the SQL Server MSDN Forums and trying to answer some questions about Analysis Services and Reporting Services. One of the questions about MDX queries seems to get repeated quite often and I will try to address it in this post, so hopefully more people will get to read this rather than ask about it on MSDN. “I have Dimension A and Dimension B, related to Measure 1. Dimension B is also related to Measure 2. How can I (is it possible to) get the values for Measure 1 filtered/sliced by Dimension A. I know it is easy to achieve with a join in SQL, but I do not know how to do it with MDX. One solution would be creating a many-to-many relationship between Dimension A and Measure Group 2. However, we may want to avoid that for some reason and answer the problem with a query. We can achieve the desired result in a number of ways but I will discuss the one using NONEMPTY. Others would be using FILTER and EXISTS. While writeback functionality in SQL Server Analysis Services 2008 has changed significantly and writeback values are stored in the OLAP cubes, in SSAS 2005 the writeback values are stored in a relational table on the same server with the fact tables. When the writeback functionality is enabled for a partition, a new table is automatically created which bears a prefix of WriteTable. Its structure is fairly simple: it contains a column for each dimension and two audit fields. The ROLAP nature of the writeback table makes it inefficient for storage of a large number of writeback records, and it is sometimes required to consolidate the data it contains with the fact table. Normally we can write a stored procedure, which can do this for us. Because the values in the WriteTable are deltas there is a new row for each user change. In example, if we change 0 to 5, there will be one row in the writeback table, which shows 5 as a measure value. If then we change the new value of 5 to 2, there will be a new row with a measure value of -3. Therefore, it could be more efficient to perform a quick aggregation of the values in the WriteTable while moving them in the fact table. This could also be contrary to our requirements if we want to be able to trace all data changes. Note how the column names are the same as the fact table column names, but are suffixed with _1, _2, etc. Unfortunately, these may change with the re-creation of the WriteTable. 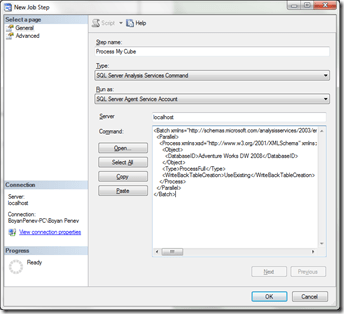 SSAS tends to assign the suffixes randomly. If that happens, our consolidation stored procedures will break. We can also script this action and use it in our automated cube processing SQL Server job. Even though this is a relatively intuitive and simple solution, I have always had problems with it because of manual cube processing performed by power users, which do destroy the writeback data together with the WriteTable structure and following from that, the code in my stored procedures. What we are effectively doing here is getting the column names from the WriteTable and then constructing an INSERT statement based on these. It is dangerous to further automate this by a while loop, as the actual column names in the WriteTable can differ from the ones in the fact table. This could happen if the dimension table key names are different to the fact table key names. Moving writeback rows through this stored procedure ensures that even if the WriteTable for a partition is re-created for some reason our code can handle it.